NeSI had a wonderful turnout at the Research Software Engineering (RSE) Birds-of-a-Feather (BoF) session at eResearch 2019. Hosted by Nooriyah Lohani, NeSI's Research Communities Advisor, attendees included RSEs, people leading a team of RSEs, and researchers with an RSE in their research group. If you can relate with any of these as part of your role, visit our website https://rse-aunz.github.io to learn more about the RSE community we’re building in New Zealand. Reminder: NeSI’s 2019 Science Coding Conference has been announced for 5-6 September in Christchurch! We’re welcoming submissions of talks, tutorials, workshops and BoFs. Visit the event website for more information. Lastly, we acknowledged the growing momentum this community is building and there was support around the table to keep things going! 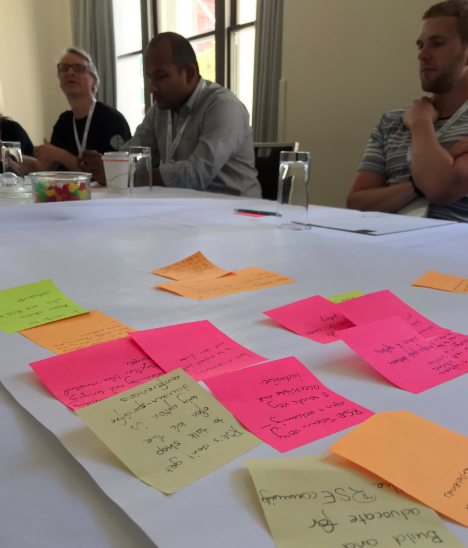 We agreed that a successful 2019 would see an open channel of communication created, a larger turnout at next year’s RSE BoF at eResearch NZ 2020 (Dunedin, dates TBC), and at least two events hosted that provide RSEs a forum to network and share their experiences. Thank you to everyone who attended this year’s BoF. If you have any questions or would like to learn more about how you can get involved in New Zealand’s RSE community, email Nooriyah Lohani (nooriyah.lohani@nesi.org.nz). New Zealand RSE Community members gathered at eResearch NZ 2019.